What makes this cake classic? 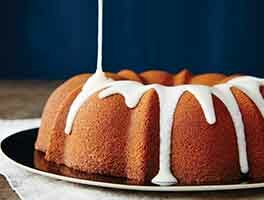 In our book, a "classic" yellow cake — read, '60s box-mix style, like Mom used to make — is marked by its pleasing moistness, its easy sliceability (no crumbling, please) and simple vanilla flavor. This cake has it all, and more: the fudge frosting on top is, well, the icing on the cake! *Buying yogurt in 6-ounce containers? Substitute one 6-ounce container + 1/4 cup (2 ounces) milk. Preheat the oven to 350°F. Lightly grease a 9" round cake pan that's at least 2" deep; for extra protection against sticking, line the pan with parchment, and grease the parchment. To make the cake: Beat together the sugar and butter until thoroughly combined. Add the eggs one at a time, beating well and scraping the bowl after each. After you've added the second egg, beat at high speed for 2 minutes; the batter will lighten in color and become fluffy. Add the vanilla, almond extract, salt, baking powder, and baking soda, stirring to combine. Starting and ending with the flour, alternately add the flour and yogurt to the mixture: 1/3 of the flour, half the yogurt, 1/3 of the flour, the remaining yogurt, and the remaining flour. Beat gently to combine after each addition. Scrape the bottom and sides of the bowl, and beat briefly. Spoon the batter into the pan. Bake the cake for 30 to 35 minutes, until it's golden brown on top, the edges are beginning to pull away from the sides of the pan, and a toothpick inserted into the center comes out clean, or with a few moist crumbs clinging to it. To make the frosting: Sift the confectioners' sugar into a mixing bowl. Melt the butter in a small saucepan. Stir in the cocoa and yogurt. Bring the mixture to a boil, then remove from the heat. Stir in the vanilla and espresso powder. Add to the confectioners' sugar in the bowl, beating until smooth. Quickly pour over the cooled cake, while the frosting is still warm. One small tweak transforms this recipe into one for Boston Cream Pie: split the cake into two rounds before frosting; fill with about 2 cups of your favorite pastry cream filling or vanilla pudding, and frost as directed. The frosting is easy to put together, but you need to work quickly once you add the hot butter mixture to the confectioners' sugar. 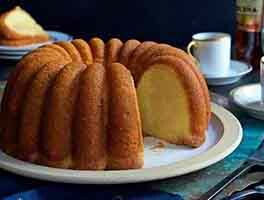 It pours easily when warm, flowing across the cake and down its sides, then drying to a glossy sheen. But if you dub around, and let it cool, you're going to be applying frosting to cake with a spatula — and it won't look nearly as pretty. Can you substitute sour cream for the yogurt? Sure. 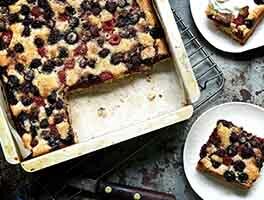 Full-fat is best; and low-fat is OK, but avoid nonfat — the cake's texture will suffer. I reviewed this recipe initially on August 19, 2018. I wanted to update with a quick summary of how I fared with my "fallen" layers that I had relegated to the freezer. Once the cake layers were thawed, I prepared 2 large trifles consisting of the following layers: cubed cake, raspberry compote, coconut custard. Repeated this twice more and topped it off with whipped cream and toasted coconut shavings. These layer cakes held up beautifully in the trifles: a delicious success that was enjoyed by several households! 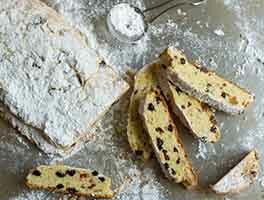 Hope my experience can help other bakers in overcoming challenges. This cake is delicious. Sturdy but light. Easy to split. So far little crumbs. In the freezer now and I think filling and icing will be a breeze. I am new to baking layer cakes so I can appreciate that I have a learning curve ahead of me! I made this cake yesterday, doubling the ingredients (except for the vanilla). Readers can learn from my mistakes and successes: The first time I made this cake, I was careful to read the instructions and feedback multiple times, especially the comments about creaming, beating, etc. to avoid over-mixing. When I removed the cakes from the oven, they looked great! Within minutes the sinking started--a large depression formed in the middle of the cake and I knew I had to try again. I did a little research to assist me in understanding what I did wrong. Halfway through the baking time, I had opened the oven door to reverse the order of the 2 pans to promote even baking--I had read, from another web site, to do this specifically at this time juncture. I later learned, again from another source, a better time to adjust pan placement is when cakes are 80% baked to insure they have "set" properly. I believe this was the root cause of my cakes sinking like the Titanic! Those layers are now in my freezer--I will use them another time to make a trifle some day. The baked outer circle tasted great--the depression was, of course, wet and under-baked. So, I had ingredients on hand to try again. And try again I did. The 2nd effort worked beautifully. I didn't touch the pans once they were in the oven. After the layers cooled on the counter, my next challenge was to slice each layer horizontally as I had made a lovely orange curd to place between each layer of cake. Again, I read numerous blogs and viewed Youtube videos on techniques and helpful hints. I decided the best route for me was to do the following: a) I chilled both layers in the fridge for about 45 minutes. b) I inserted toothpicks every 4 or 5 inches around the circumference of the layer, marking the vertical half-way point. c) I cut off a lengthy piece of dental floss, long enough to encircle the cake layer and give me something to grip onto. d) I positioned the dental floss around the cake layer, using the toothpicks as a guide. Be careful the dental floss does not "ride up" or slip below the position of the tooth picks. e) Once the dental floss is in place, I took the loose ends and crossed them over one another in the fashion of a half-knot. This secured the floss but would enable me to still cut into the cake. f) I pulled the loose ends of the floss, maintaining an angle relative to the cake layer, forcing the floss to cut into the layers. g) As this cake is tender, I was careful to use a thin piece of metal (bottom disk of a remove-able quiche pan) to ease under the top layer, lift it up securely and position it elsewhere until I built my layers. HELPFUL HINT: some dental flosses are flimsy and break easily. This is NOT what you want to use. Use a strong, sturdy floss--this method for slicing cake layers horizontally worked well for me. FINISHED PRODUCT: Classic Yellow Cake (2 layers divided into 4 layers), Orange Curd in between each layer, Chocolate Ganache Frosting on top and sides. Absolutely yummy! I made this cake for my boyfriend's birthday and it was a big hit! The chocolate icing was delicious. 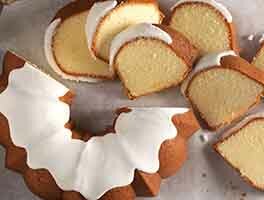 Question, if I wanted to make it with a vanilla icing, any recommendations of a recipe to use? Buttery, moist, delicious. 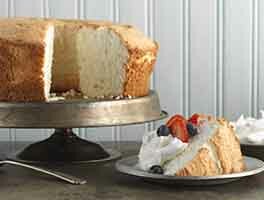 The perfect recipe when you do not need a large cake. I used the Hershey's cocoa frosting recipe so cannot rate the frosting. Delicious! I doubled the almond extract and added 2 T Amaretto. The result was fairly almond-y, but I may try to sneak in a bit more extract and/or Amaretto next time. My main concern was sufficient sturdiness for splitting the cake to add a filling. The cake performed very nicely -- no falling apart, no excess crumbs. Very good with the cherry jam/cherry brandy/cream cheese filling I made, plus a fudge frosting from a different recipe. I tried to make cupcakes with this recipe. The cupcakes spilled over the top of the cupcake rim and flattened out. tasted great but not very attractive. I was looking for a recipe to replace a box mix for cupcakes. This is a great cake but not great for cupcakes. I tried it twice. Flavor is very good though. The taste is good.. I bake lots of cakes, followed the recipe for the cake exactly as written. At the thirty minute mark it seemed raw in the middle, too much of a jiggle. I let it bake 5 more mins, seemed fine after that. I did not make the fudge topping exactly as written, I felt like it was just too much sugar for our liking. This is coming from someone that loves dark chocolate. I noticed a few other people in the comments thought something similar. I added 1 1/2 cup of powdered sugar, put a little cream to thin it out a bit. Looks just like the photo but with a darker tone on the fudge. I'm sure someone may love it, for us though, it was just good. I think even if you do not like dark chocolate, I still wouldn't use all the amount of powdered sugar.